There have been, what...eighteen new collections from Sally Hansen already this year? It seems like almost every line has had new core or LE shades. Their summer collections tie together in a theme called Color Destinations, inspired by vacation spots. Triple Shine, a line that's only a few months old itself, has two! Seasational and Archipela-Glow are from the Tahiti Sunset collection. When I first saw it on Nouveau Cheap, I kinda shrugged it off. As happens so often though, I kept seeing the display in stores and I kept looking. Microglitter is one of my many weaknesses, after all. Coupons are another. After a lot of deliberation, and with a bunch of coupons, I bought these two at CVS. Seasational is a bright blue-green cream. See that green streak? It wasn't going anywhere. I've come to accept it. This isn't the first Triple Shine shade I've bought, but it's the first I've worn. I'm impressed! It's thick, smooth, and glossy even before topcoat. Seasational is almost a one-coater, but I used two. I got pinprick bubbling, but I think I know why. My dying laptop that's rigged to pretend it's a desktop is on its last legs and needs a fan to prevent it from overheating. The fan is under my desk, but I think it might be causing issues anyway. Erg. Good thing The Beard is rebuilding a computer for me this summer! If it's not the fan, maybe it's the brush. It's awkward to me somehow. I think I'm just not used to it. At least the chunky outer caps are designed to pull off easily. Thank you endlessly for that, Ms. Hansen! Anyway...can you even see the bubbles? Even with macro? They were almost invisible once I topcoated. ...and they were barely noticeable before that. I made sure to get a picture before topcoat to show off the shine. I never skip topcoat for anything that's supposed to be glossy, but it's still quite impressive! Archipela-Glow has teal microglitter in a teal tinted base. When I showed Archipela-Glow to Zeus, he said "I want it. What is it?" right away. Microglitters are always better in person, but I think the impact comes across ok in photos this time. It's dazzling and mermaidy. That's a word even if Chrome says otherwise. Nichole has something similar, but I'm drawing a total blank on what it is. Dammit. This is three coats because the base is sheer and the glitter isn't super-dense. It's nice and thick though, so it applies really well. The tint gives it great depth and the shine is outstanding once it's topcoated. It's not "thirsty" either, smoothing out easily. Like Seasational, it's even shiny before topcoat. Not rough either, but I do prefer it smoothed out completely. Bottom line: Both are good and I'm pleased with the Triple Shine line so far! 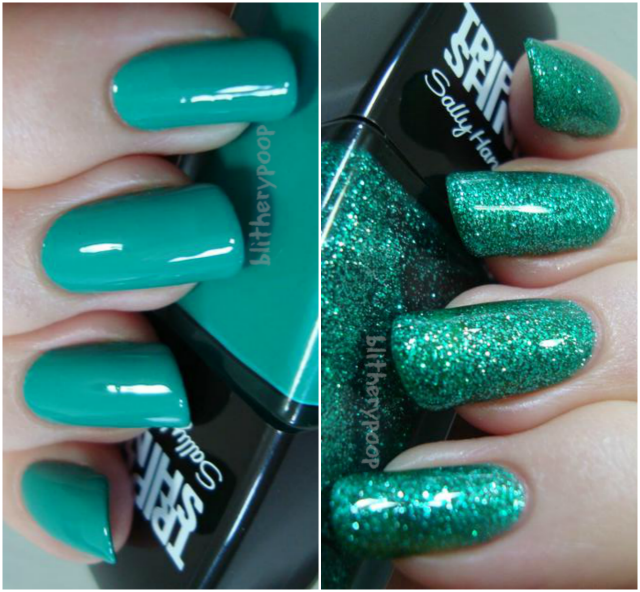 If you don't have a teal microglitter, you might need Archipela-Glow. Both are very pretty! I really like Hypnautical from that line, it's a blue/green opalescent shard sort of thing and looks amazing over Barielle A Bouquet for Ava. From this collection I'm obsessed with Sparktacular, I loved it. These are the colors I keep staring at when I see them in CVS. This has NOT convinced me that I don't need them. So pretty!